Rainbow Write numbers 1-30 with this product from Miss Hellen's Hippos! Trace each number in rainbow order...red, orange, yellow, green, blue, purple...don't forget to color the corresponding crayon as you go! Each page is supplemented with corresponding pictures that feature the number of focus..
Quickly and easily assess writing numbers. Includes scoring sheet. Part 3 of 4 assessments. Check out my bundle for some discounts! This is a handout to use in a math center. You can also use this whole group, small group, or with a math tutor. The children identify the missing number by counting and write it in the box. I use this in the beginning of the year. This product was intended for use as an independent activity after the proper number formation is taught. 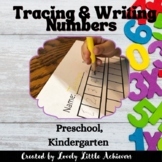 This is a simple workbook that allows students to practice writing their numbers 1-30, as well as representing the numbers using word form, picture form, and in a tens frame. Scaffolded tasks... Writing 1-10 Writing 1-20 Writing 1-30 Counting tasks on the bottom for early finishers. Daily number practice for TK and Kinder students. 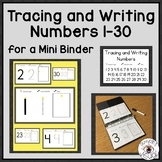 Students can use these sheets for practicing writing numbers 1-30. Missing numbers 1-30 with number line practice. 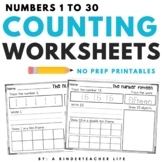 Also writing numbers 1-30 practice on each worksheet. 3 Worksheet packet. Any can be used as an assessment.